This holiday season, skip the overcrowded restaurants and treat your loved ones to a luxury Christmas Eve dinner cruise, a Viator Exclusive available nowhere else. 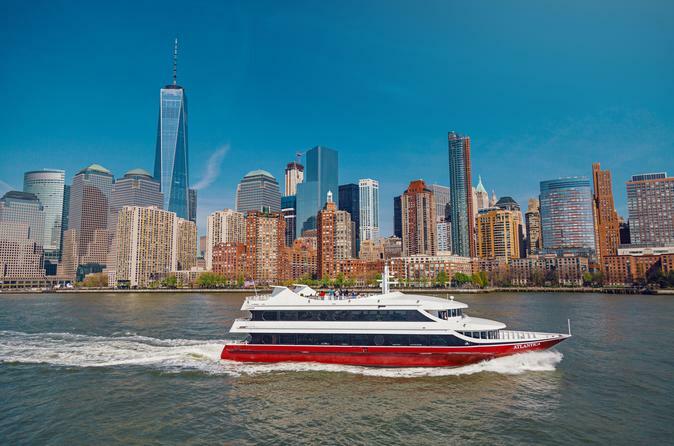 Set sail from Chelsea Piers aboard an elegant yacht with panoramic windows and an outdoor observation deck, offering stellar views of the Statue of Liberty, Empire State Building, Brooklyn Bridge and more. Revel in three hours of good food, music, cocktails and memories with family and friends against the backdrop of the Manhattan skyline. It's a Christmas in New York you won't forget! On December 24, put on your dressy holiday outfit and head to the Chelsea Piers to board the Atlantica, New York City's premier dining yacht, for your exclusive 2-hour Christmas Eve dinner cruise. Savor the excitement as you set off along the Hudson River like Manhattan's high rollers, just as the city begins to twinkle at night. Tasteful holiday decorations and soft lighting welcome you to the grand dining room, where an upscale, freshly prepared buffet dinner and premium open bar await. Take a seat near the picture windows to gaze out at the New York City skyline as you dine and sip complimentary crafted cocktails, beer and wine. After dinner, head to the observation deck to take in New York City's dazzling nighttime skyline. You'll be treated to a panorama of New York's most famous landmarks including the Statue of Liberty, the Brooklyn Bridge, the Empire State Building, Governor’s Island, Ellis Island, the Colgate Clock and much more. Return downstairs to cap off the evening with dancing on the spacious dance floor, as the yacht transforms into a veritable floating ballroom. A live DJ will be spinning the music, cocktails will flow and good times unrivaled anywhere else on Christmas Eve will continue until the Atlantica sails back to Chelsea Piers after two hours on the water.